»Pahalgam To Gulmarg – Paradise For Nature Lovers! Pahalgam To Gulmarg – Paradise For Nature Lovers! 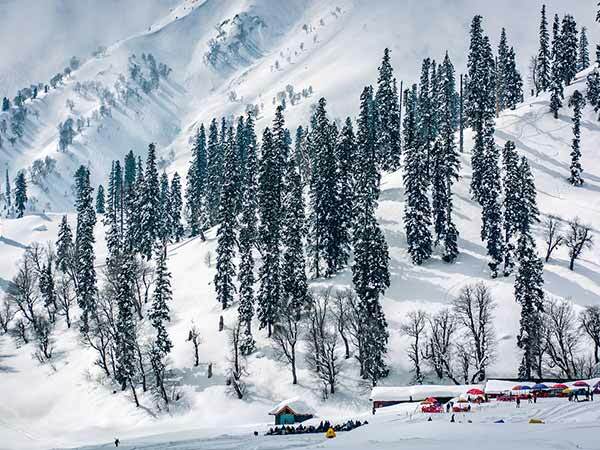 Nestled amidst lush-green meadows, snow-capped mountains, evergreen forested hills and valleys, Gulmarg forms a perfect destination for the romantics. Undoubtedly, this also goes without saying that innumerable Bollywood movies have been shot here. This quaint and serene town is situated in the Western Himalayas. It lies at an altitude of 8,694 ft. Going further and strolling around, one can witness the captivating views of Nanga Parbat and Harmukh mountains. Titled as the Heartland of Winter Sports in India and rated as Asia's seventh best ski destination, it is bound to attract the seekers of adrenaline rush. It is home to Indian Institute of Mountaineering and Skiing. If you wish to do a course at this institute, you will have to make your bookings at least 2 years in advance. One can experience nature in its purest forms. The travellers from India and abroad have gone gaga over the mesmerising beauty of Gulmarg! Participate in Gulmarg Winter Festival, if the terminology art relates with your personality. This annual festival roars its popularity in the month of March. Budding photographers and music and film lovers will find themselves here during this time of the year. It is a great platform to showcase their talent. Dive in fearlessly into this charming city of Jammu and Kashmir and gorge on some scrumptious traditional delicacies! To play with snow, you can visit any time of the year. If negative temperatures and snowfall is what you are looking for, then October to March is the peak time to visit. Adventure enthusiasts should also opt for winters. Although summers are not snow-packed, you will not be disappointed if you are planning a trip during this time. You will know why Gulmarg is named as Meadow of Flowers during summers. The range of colours that you will get to see is remarkable. By Road: The distance between Pahalgam and Gulmarg stretches about 140 km via route 1 and 146 km via route 2. Route 1 will take about 4 hours and 15 minutes. The time taken by route 2 is more, i.e., 4 hours and 45 minutes. If you start early from Pahalgam, you will reach Gulmarg early. Then you will have an entire day in your hands to explore Gulmarg. Stall in at one of the innumerable dhabas that come on the way. It is advisable to take the ride in the afternoon if you intend to click spellbinding pictures of some sightseeing spots. The 86 km drive to Srinagar is filled with scenic views and beautiful Kashmir valleys. You will also come across amazing apple orchards on the way. Dal Lake is an eminent spot for houseboats. Mughal gardens, which were laid down by Mughal emperors, are few serene places in Srinagar. Visit Shankaracharya Temple and Kheer Bhawani Temple; they are significant Hindu temples in Kashmir. Shopaholics binge in for embroidered traditional Pashmina shawls and hand-woven silks. The natives are taught techniques of Persian crafts and arts even today. This has, thus, become a hub of talented artisans. For exquisite quality of handicraft items, paper mache articles and souvenirs visit M Sadiq & Sons. This store is a renowned export house for products like vases, sheeshas and intricate furniture. Ride for another 53 km to land in the paradise of snow - Gulmarg! By Rail:There are no rail routes between Pahalgam and Gulmarg. By Bus: There are no direct bus services available between Pahalgam and Gulmarg. The frequency of buses between Pahalgam and Srinagar and Srinagar to Gulmarg is quite good. By Air: Gulmarg is not served by an airport. Sheikh ul-Alam International Airport in Srinagar is the nearest airport to Gulmarg, located at a distance of 56 km. You can hire taxis or hop on state buses that frequently run from Srinagar. Ever seen ducks walking on the lake? Yes! Alpather Lake is frozen during winters. And there's no better time to experience the spellbinding stride in the paradise itself. Located on the foothills of the renowned twin Aparwath Peak, the lake is about 13 km from Gulmarg. If you have ample time, then it is a perfect opportunity to include this day trek in your itinerary. This destination is no less appealing during summers. You can witness the lake water in its purest form. The enchanting and beautiful flowers with tall sturdy trees will give you a vibe of attaining solitude. Gulmarg Golf Course is an ideal place to try your hands at golfing. It doesn't matter whether you are an ace at it or not. Just go there and golf to gain experience. Golfing at an altitude of 2,650 ft is an ultimate chance that one shouldn't miss. The 18-hole golf course is world's second highest golf course. It stretches over an area of 7,505 yards. Summers are perfect to visit this golf arena. Ride in the second highest cable car in the world and witness some exceptionally astounding views of Gulmarg. If adventure thrills you, then start early to reach the first stop at Kongdori, located at 8,530 ft. The second stop is at 12,293 ft. Don't miss the magnificent Strawberry Valley and Leopards Valley. Shark Fin is evidently visible from Mount Apharwat. It provides skiers the best opportunity to rip apart the powdery white snow. With steep slopes that the bowl-shaped structure offers, it is a great stop for professional and amateur skiers. Since skiing is not available at many places in India, Shark Fin is a renowned destination for adventure junkies. If you are scared of heights, then you can opt for taking a short ride on the gondola. If not then go ahead, start early and explore your adventurous side. Feel the snow, let your hair loose and dive in the spectacular views of nature.